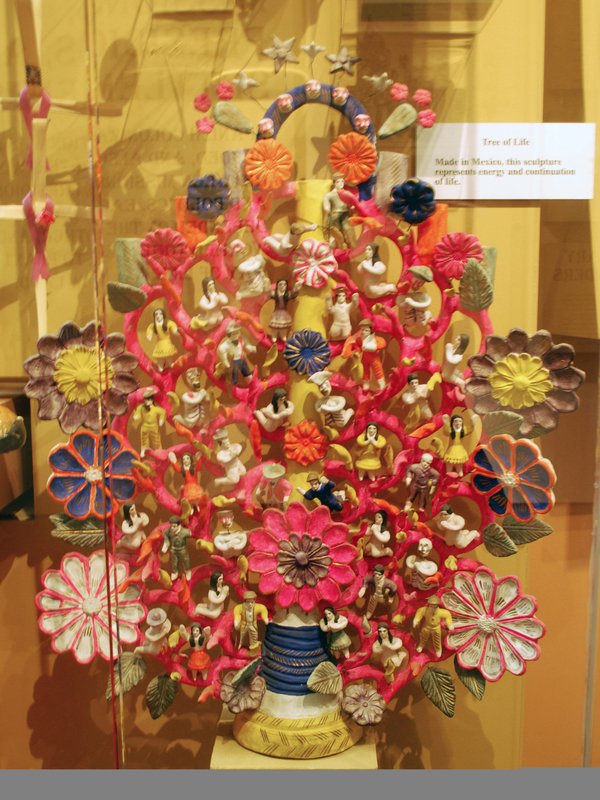 This object is a Tree of Life candelabra made from paper mache for the Dia de los Muertos (Day of the Dead) celebration. It is decorated with flowers, small figures of people, and small figures of skeletons. The candelabra is decorated in bright colors such as pinks, purples, blues, yellows, and oranges. Since the candelabra is made using the style of the Tree of Life and with the theme of Dia de Los Muertos (Day of the Dead) it is likely that the object was made in Mexico. The Tree of Life is a theme that is seen from several cultures all over the world and is also referred to as the World Tree. This tree is used to explain creation and how the world and cosmos function together. Depending on the culture, the tree is either an actual tree that exists in the world or is a metaphor. In Mesoamerica the Tree of Life is a typically thought of as part of the Axis Mundi; the branches supported the heavens, the trunk of the tree was the earth, and the roots were the underworld. The tree divided the universe into four sections with each section being associated with a different cardinal direction, element, color, season, etc. With the conquest by the Spanish the old gods and beliefs were systematically eliminated and replaced with Christianity. So the idea of the World Tree as the center of the Axis Mundi was transformed into the Tree of Life with stories from the Bible being told instead of the old mythologies of the Mesoamerican cultures. The Tree of Life candelabras are generally made from clay and are meant to hold incense burners or candles, though if they are for purely decorative purposes they are sometimes made from paper mache. These decorative versions still have the holders for incense or candles, but they are not meant to be burned. These incense/candelabras started being commissioned by the Spanish friars with the theme being the Garden of Eden, Adam and Eve, and The Fall. After years the themes that were used for the Tree of Life candelabras started to change and incorporate other ideas based on the artists preferences. Biblical stories, the histories of Mesoamerica and their cultures, Dia de los Muertos themes, and even some whimsical themes were starting to be used. Most of these types of candelabras are made in three areas in Mexico: Metepec in the state of Mexico, Izucar de Matamoros in the state of Puebla, and Acatlan de Osorio also in the state of Puebla. These three towns are well known for their pottery styles and their local artists. Eliade, Mircea. 1991. Images and symbols: studies in religious symbolism. Princeton, N.J.: Princeton University Press. Eliade, Mircea, and Diane Apostolos-Cappadona. 1992. Symbolism, the sacred, and the arts. New York: Continuum. Greenleigh, John, and Rosalind Rosoff Beimler. 1998. The days of the dead: Mexico’s Festival of Communion with the Departed. Rohnert Park, CA: Pomegranate. Haley, Shawn D., and Curt Fukuda. 2004. Day of the Dead: when two worlds meet in Oaxaca. New York: Berghahn Books. Leeming, David Adams, and David Adams Leeming. 2010. Creation myths of the world: an encyclopedia. Santa Barbara, Calif: ABC-CLIO. Marchi, Regina M. 2009. Day of the Dead in the USA the migration and transformation of a cultural phenomenon. New Brunswick, N.J.: Rutgers University Press. http://search.ebscohost.com/login.aspx?direct=true&scope=site&db=nlebk&db=nlabk&AN=311994. Mulryan, Lenore Hoag, and Delia A. Cosentino. 2003. Ceramic trees of life: popular art from Mexico. Los Angeles: UCLA Fowler Museum of Cultural History. Whitcomb, Therese T., and Linda McAllister. 1983. Árbol de la vida, the ceramics of Metepec: an evolutionary study of the Mexican tree of life. San Diego, Ca: University of San Diego.